Here at Dropbox, we take your work seriously. That’s why we build products that help you get your best work done. Now, for the first time, we’re giving you an inside look at how customer feedback and user research are helping us take the work out of work. Part 1: Mobile work. How do we design a mobile app that lets people get real work done on the go—without creating an expectation of round-the-clock responsiveness? 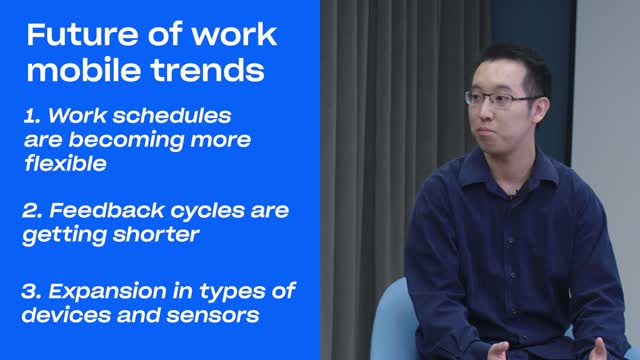 Hear the research behind our latest mobile app and insights on the future of mobile work. Part 2: Unblocking workflows with Dropbox previews. You might not always have the right software needed to open and view your files. At Dropbox we solved this problem for our users with a best-in-class previews platform. Even if you work with massive design and media files, we’ve got you covered. Part 3: Coordinating work with timelines in Dropbox Paper. The nature of teamwork is changing. Increasingly, coordination is a part of everyone’s job. That’s why we built Dropbox Paper, a collaborative workspace that brings collaboration and coordination together. Learn how we approach the work of managing work with timelines, Paper's newest feature. Dropbox Business is an easy-to-manage tool that delivers enterprise-grade security. See how our unmatched usability leads to best-in-class adoption and a tight control over your data. Learn how our exabyte-scale architecture provides ultimate sync collaboration capabilities, and discover how to integrate with the most partner apps. Learn how Dropbox and Salesforce help teams eliminate distractions and stay in the flow of their work. Explore how our product integrations streamline workflows and hear from Dow Jones, one of our joint customers, who'll share how their Dropbox and Salesforce integration is core to the company's digital transformation strategy -- helping the company drive collaboration across internal teams as well as with external partners. Join our upcoming webcast presented by Cori Biruk, Global Director of SaaS and Collaboration at Dow Jones, and George Baier IV, Product Marketing Team Lead at Dropbox. Despite productivity gains promised by a wide array of tools, many employees are left feeling disengaged or unfocused. Instead of perpetually searching for the next best thing or being stuck with processes that just don’t work, IT and business leaders can learn how to harness the power of these tools to help teams better plan, collaborate on, and execute work that matters. From state to local governments, and throughout the public sector, employees and staff are seeking better ways to collaborate and boost productivity. But collaboration can be complicated when you're working across different teams, committees, and counties. Judy Price, Town Clerk for the town of Truckee, California, will share her experience using Dropbox Business to save time, money, and effort, and focus on the issues that really matter to her city. Security is critical when you store your data in the cloud. And that means being confident your solution protects sensitive data, maintains compliance, and ensures privacy. We’ve made security a foundation of Dropbox Business through everything from our infrastructure design, to the admin and user security tools we provide, to the ongoing independent verification of our systems. Digital transformation requires radically different thinking about the role of technology in driving business outcomes. While it’s easy to focus exclusively on customer facing technologies, without an end-to-end technology strategy, these initiatives are doomed to fall on the scrap heap of failed “digital illusions”. To drive true change, you must consider the role of your end-to-end technology strategy with an eye toward a foundation that supports new and very different business journeys and outcomes. Join Rob Koplowitz, VP & Principal Analyst with Forrester, to learn about the role of a solid technology foundation in supporting your digital transformation strategy.